18 Months - $29.99 24 Months - $29.99 Only 1 left! Q: What do you call a baby owl who got caught in the rain? The owl is an ancient symbol of intelligence. Its big, soulful eyes suggest an unspoken but profound knowledge. It is the symbol of Athena, the Greek goddess of wisdom. And its haunting “hoo” evokes mystery every time it bounces around the dark forest. So what better animal could your baby, who doesn’t need to know anything because they’ve got you around to do everything, dress up as? 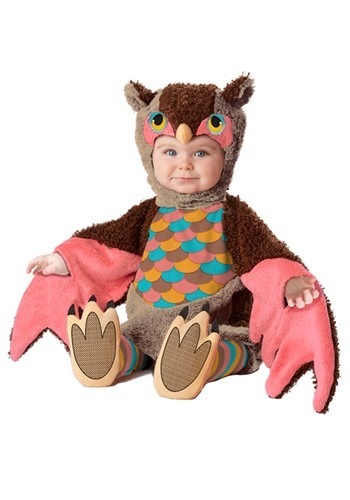 Our cute, colorful, and cozy Infant Owlette Costume will have your little one looking ready to explore the night sky in search of small rodents. The soft fabric is gentle on their delicate baby skin, and they’ll be able to use their hands courtesy of the slits in the wings. Everyone will drop what they’re doing when they see those big adorable eyes -- and the hood has cute eyes too!